Pack of 100 Certificates - Michigan Consoldiated Gas Company - Price includes shipping costs to U.S.
Home > Certificate Quantities for Educators / Business Promotions > Pack of 100 Certificates - Michigan Consoldiated Gas Company - Price includes shipping costs to U.S. 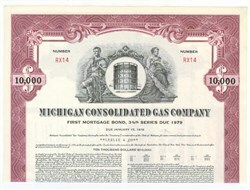 Pack of 100 Certificates - Michigan Consolidated Gas Company - Price includes shipping costs to U.S. Beautifully engraved certificate from the Michigan Consolidated Gas Company This historic document has an ornate border around it with a vignette of allegorical figures flanking an oil storage tank. This item has the printed signatures of the Company’s President and Secretary. The scan only shows the top part of the certificate.